With their biggest meets of the season fast approaching, the Scappoose High boys and girls swim teams took to the water for the Blanchet Catholic Invitational on Saturday, Jan. 26, in Salem. The Indians boys placed second out of eight teams while the Indians girls were fifth out of nine squads. Silverton won both titles at the Salvation Army Ray & Joan Kroc Corps Community Center. The Foxes scored 310 points in the boys meet, with Scappoose at 209, and Taft third with 180. Host Blanchet Catholic was fourth with 97. The Silverton girls tallied 375 points and more than doubled the total of runner-up Valley Catholic (152). Taft was third with 134. Blanchet Catholic took fourth with 107, and Scappoose had 87 for an eight-point edge on sixth-place Molalla. Scappoose junior Bryant Sharp was a standout. He swam PR anchor legs in the 200 medley relay and 200 freestyle relay and notched a three-second personal best in the 100 free. "He had a monster meet," coach David Richmond said. Both those boys relays teams finished second, and Sharp took second in the 100 free to sophomore teammate Will Blair. "Bryant went out fast and made a huge push at the end to almost catch Will in the final yards," Richmond said. The boys 100 free has been a top event for the Indians. "Having those two sprinters gives us a big 1-2 punch every meet," Richmond said. The Indians came with .60 of winning all three relays; they placed second in the 400 freestyle relay as well. 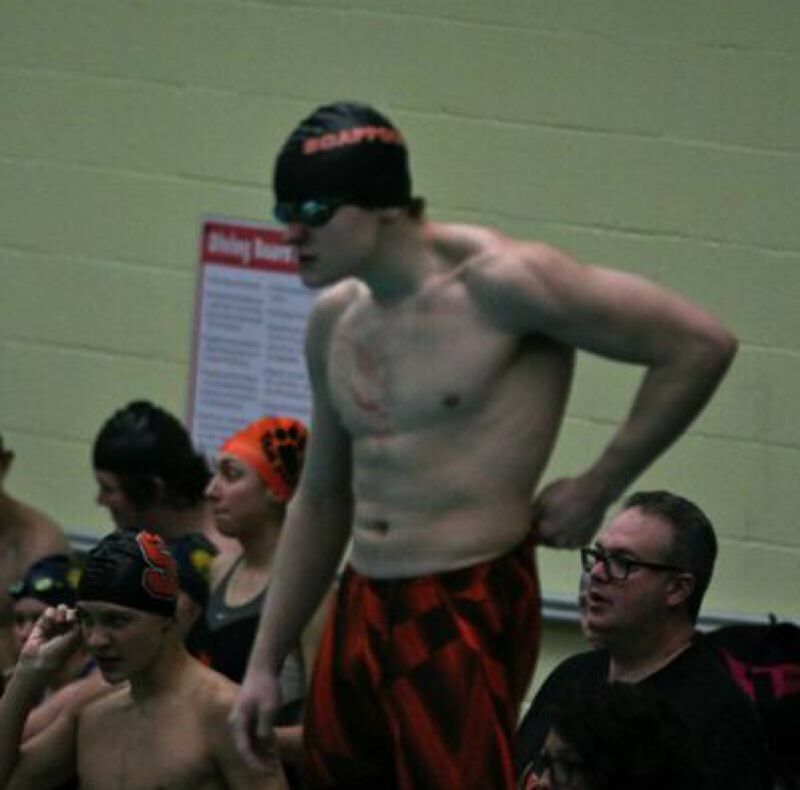 "We swam really well in the medley and 200 free, and had the second-fastest time in school history in the 200 free," Richmond noted, "but we got edged out in the 400, which we should have dominated." Silverton took first in that one in 3 minutes, 40.11 seconds. The Scappoose team of junior Nash Wilson, senior Quincy Reynolds, senior Panachai Kongja and Blair touched the wall in 3:40.29. Taft was third in 3:43.30, and North Marion placed fourth in 3:49.33. "We've been sick, and guys were worn down, but Will put in one of his best anchor legs ever to almost pull it out," Richmond said. "He needed about two more strokes to take the lead." Wilson, Kongja, junior Cadmen Posvar and Sharp made up the 200 medley relay for the Indians. In the 200 free relay, the Indians' lineup consisted of Blair, Reynolds, Posvar and Sharp. For the Scappoose girls, junior Emma Hinsvark and junior Kelsey Ela had notable performances in the Blanchet Catholic meet. Hinsvark dropped her personal best in the 500 free by 11 seconds. Ela set personal bests in the 50 and 100 free, turning in a 28.33 and a 1:03.60 for a pair of sixth-place finishes. The season is about to conclude, with Scappoose headed to Astoria, a familiar site. The Indians will swim at the Class 4A Cowapa League championships but this year in an official non-scoring role and as a final tune-up for their own 5A Northwest Oregon Conference district meet. The Cowapa championships, which the Indians boys won the past two years before moving up in classification, are Friday afternoon at Astoria Aquatic Center. The NWOC championships will take place at Friday and Saturday at Parkrose High. State qualifiers will go to the Oregon School Activities Championships, set for 5A prelims from 1:45 p.m. to 4:30 p.m. Friday, Feb. 15 at Tualatin Hills Aquatic Center in Beaverton and 5A finals on Saturday, Feb. 16, from 1 p.m. to a 3:42 p.m. start for the final race of 22.